I previously reviewed Angie's List. I like the service overall and I do find it a good value... but there were a couple things I wasn't impressed with. I didn't like their advanced search functions and I did not like how they displayed the grades. Well at some point it seems they improved one of those 2 things. They added a new 'histogram' link for the grades that displays the break down of how many A, B, C, D or F grades each company got. As you can see the overall grade is an 'A' which is the best, but out of 11 reviews they got a 'C' grade and a 'D' grade along with a bunch of A's. I think this is pretty useful information. 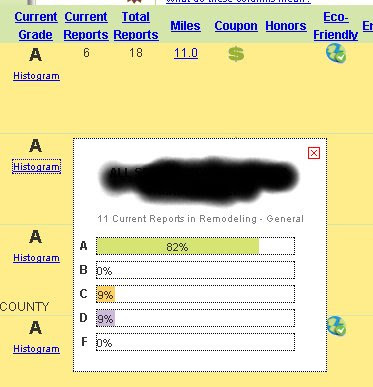 A contractor with 11 x A grades has done better than a contractor with 9 x A's, one C and one D. With the histogram you can easily see that breakdown. Without the histogram you had to drill down into each contractor and skim through all the reviews to see what the breakdown of grades looked like. This is a welcome improvement. Now all they have to do is improve their search engine.